(NaturalNews) Whole Foods Market (WFM) was caught in a blatant, brazen lie today after Natural News published a report that showed Whole Foods joining with Monsanto to support a GMO "fake labeling" bill in the U.S. Senate. The proposed new law would outlaw GMO labeling nationwide for up to two years, then roll out a GMO labeling "compromise" that would allow companies to use QR code (machine language) labeling that isn't readable by humans. The proposed law, in other words, is a fraud. It would not require any sort of GMO labeling that's readable by human beings, and it would destroy the only existing labeling law that requires real, honest labeling (the Vermont law). As news of the betrayal spread across the internet, the Whole Foods Big Lie machine went into action, deliberately spreading false and misleading information via social media to deny the fact that Whole Foods' own CEO, Walter Robb, is on the record openly supporting this Monsanto-engineered GMO fake labeling law (see below). There is no truth to these claims. 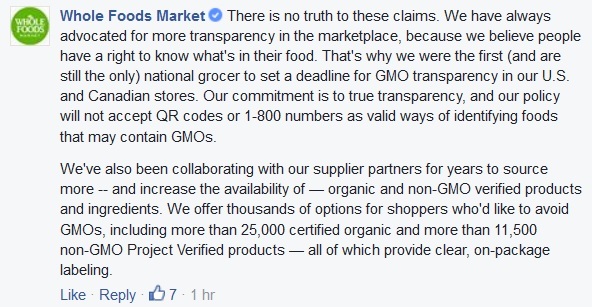 We have always advocated for more transparency in the marketplace, because we believe people have a right to know what's in their food... Our commitment is to true transparency, and our policy will not accept QR codes or 1-800 numbers as valid ways of identifying foods that may contain GMOs. ASPEN, Colo. - Three leading voices in the so-called "good food" sector today urged support for the Senate's bipartisan compromise on GMO labeling, a bill that would preempt Vermont's labeling law and provide options for companies to disclose genetically modified ingredients. Walter Robb, co-CEO of Whole Foods Market, Jeff Dunn, president of Campbell Fresh, and Sam Kass, a former White House adviser who now works with food tech companies, all praised Sens. Pat Roberts and Debbie Stabenow for coming to an agreement on a national solution during a panel discussion at the Aspen Ideas Festival. "It's not perfect, but it's progress not perfection," said Dunn, who noted that Campbell's was the first major food company to voluntarily label its products. "It's a step in the right direction." [Walter] Robb said it was an "incredible thing" that the senators came together and compromised during a dysfunctional time. He said he hopes that lawmakers can soon move on to other things. ...Kass, who has already lauded the Senate for the compromise, said he'd prefer on-pack labels, but argued that advocates got 75 percent of what they wanted and the deal should be supported. For further proof that Whole Foods' deceptive spin social media team is lying to your face, just watch this Aspen Institute video recorded three days ago. Question: What's your take on is this a bill that should get passed or not? My view on the bill is that, and I'm pretty intimately aware of it, is that I think it's an incredible thing that Sen. Stabenow has put together with Sen. Robert, when you take a look at the atmosphere up there on Capitol Hill, that this much was accomplished together. Whether it passes or not is an open question of the next couple of weeks. The alternative is that Vermont goes into effect and then there's a number of other states behind that, it makes it difficult for manufacturers to be able to label and label to that different standard... and frankly the Vermont bill while it's... the national bill would have never happened if Vermont had not passed. There just wouldn't have been the pressure... it's a very imperfect bill. It doesn't cover a lot of products, there's gaps and inconsistencies that ultimately are probably better addressed through some sort of a national standard. And I think the way she's put the bill together, which is to give manufacturers choices, is I think the marketplace and the customers will take it from here... so obviously, I think she's done a great piece of work... we are already are out there further with our commitment to full transparency by 2018. We're not gonna... we're looking at how these two live with each other, but we're already past that, but I think in this day and age, to come together, to create some sort of a reasonable standard that manufacturers can... and gives the customer a lot more information is a pretty good thing. Walter Robb, in other words, loves the idea that the new federal mandate would "give manufacturers choice" instead of requiring mandatory, clear labeling. And he praises the compromise just as Monsanto operatives do. It's a huge WIN for Monsanto, and Whole Foods CEO Walter Robb just can't praise it enough! • The new law would immediately kill the Vermont GMO labeling law due to kick in this Friday, denying the citizens of Vermont the right to know whether they are eating GMOs. • It would permanently outlaw state GMO labeling laws nationwide. • It allows NO LABELING for up to two years while the USDA figures out what sort of labeling to require. • It gives food manufacturers "choices" to use non-human-readable labels that can only be read by bar code scanners. This allows food companies to hide the truth about GMOs behind digital machine code. • It does not require the GMO labeling of meats or dairy products from animals raised entirely on GMO feed. • It allows the USDA to arbitrarily decide what percentage of GMOs in a food item trigger a required GMO label (or bar code). This level could theoretically be set at 50% or even 90%. • The proposed law was masterminded by Monsanto-influenced lawmakers as a way to destroy state GMO labeling laws while falsely claiming to have a "national GMO labeling mandate" that's pure fraud. • Whole Foods CEO Walter Robb fully supports this proposed law, calling it an "incredible thing" that was "accomplished together." As is obvious here, Whole Foods own CEO Walter Robb is on the record supporting the GMO fake labeling "compromise" that was pushed through the Senate by Monsanto. This is undeniable. Yet the Whole Foods social media liars and deception artists ridiculously proclaim "There is no truth to these claims. We have always advocated for more transparency in the marketplace..."
It's complete B.S., of course, but that's what Whole Foods is peddling these days. Remember: This is also the same retailer that trained its managers to lie to the public about GMOs, all while selling protein powders containing alarming levels of toxic heavy metals (and refusing to do anything about it). Whole Foods has a long history of being so deceptive about GMOs that some people now call it Wholesanto. The truth on this is simple: For the last two decades, Whole Foods has been selling unlabeled GMOs, heavy metals and pesticides to health-conscious customers who now demand honest labeling. And now when Monsanto twists the U.S. Senate into advancing a law that would outlaw the existing Vermont GMO labeling law, Whole Foods' own CEO Walter Robb publicly praises it, followed by the Whole Foods propaganda liars denying any such thing ever happened. Just WOW. Now we finally see the truth come out as Whole Foods joins Monsanto in supporting a GMO labeling bill that would deny consumers the right to know what they're eating with clear, human-readable labeling. Not only is Whole Foods joining forces with Monsanto to destroy the courageous, pioneering Vermont labeling law, it's also blatantly lying to its own customers and denying any of this is true. As an investigative journalist and food lab science director, the one thing I've learned about Whole Foods over the last few years is that Whole Foods has long abandoned integrity and seeks only profit via deception. Whole Foods confirms it knowingly sells products containing Monsanto's genetically modified corn: Don't ask, don't tell!